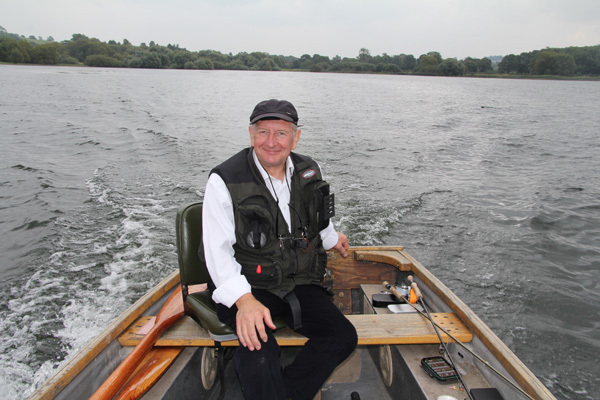 I don’t normally fish for trout that often however a friend Roger had a spare place on a boat fishing Blagdon lake. Well never having dipped a line in one of the best original trout reservoirs in the UK how could I refuse. The day was still with bright sun early in the morning with cloud coming over during the afternoon. Well it’s no good asking me what flies we used I’ve got two, one black the other white. Roger had a great selection. Roger chose one called a “Muncher” the other a small nymph. We moved off up the lake to one of Rogers favorite places. There were a few trout rising however none could be taken. We moved slightly to a better position and only about 30 yds. Sure enough after a short time I hooked a small trout only for it to throw the hook. No other fish came to us. We moved again to another one of Rogers favorite places. Sure enough Roger’s fly was taken by a lovely rainbow trout which gave a great account of itself. It was about 3lbs. Then nothing came along so we moved a little further down the bank. Bang I was into another trout that took the fly with some force. It looked a good fish and I was just saying you need a big bag of chips with this trout when the hook pulled again. So that was it. Roger was soon in again playing a trout of about 3lbs. They really do pull the #7 rods and take a good amount of line. So 2-0 to Roger and me still blanking. We moved again to another spot where finally I hooked and landed a nice small trout of about 2lbs 12oz. Time was moving on and it was soon time to rethink where we needed to spend the final couple of hours. We decide to move back to where we originally started. So Roger fired up the motor and we were off. On arrival we found plenty of trout rising and taking nymphs from the surface. We were the only boat in the vicinity and so anchored up. The surface of the lake was slightly rippled however the trout were feeding on the surface at the edge of the flat calm water near the bank. Well I hooked another trout that I managed to land which made it a 2-2 draw. 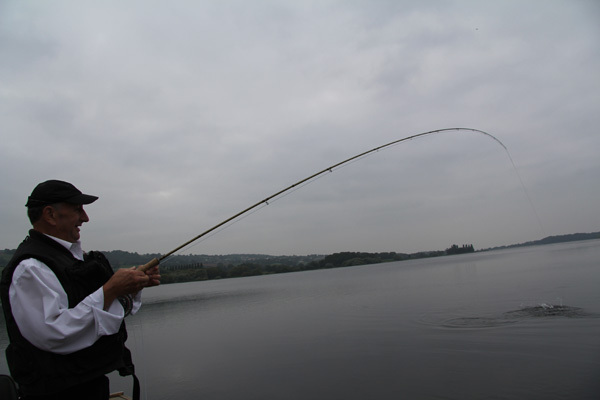 I then had another chance by casting at a surface feeding trout however the hook came out again. Roger saw one fish rise and cast in the direction he thought the fish was travelling. Bingo off went his line as it zipped through the water as he played a lovely trout of about 3lbs. 3-2 to Roger. Then what happened next saw me hook a much larger trout that jumped so many times it was quite incredible. It probably spent more time out of the water than in. At one point it jumped over Rogers line and around the back of the boat still jumping. Then there was one last jump and off it went to be caught another day. Roger said he had never seen a trout jump so much, which was little consolation to me. With trout still rising we up anchored as we were a fair distance from the lodge. Off we set and all went well until we ran out of fuel. With my arm hanging off from all the casting I grabbed the oars and started rowing the 400 yds back to the lodge. However with it being a perfect evening with not a breath of wind it was a kind of joy to be there. So a 50% landing rate for me was not good fishing. However it was an excellent day and one I’ll repeat again in the company of a superb fly angler as Roger who has 40 years experience on the Bristol lakes. Thanks a million Roger. Sorry Barbel fishing for you next year.! Next blog is a days fishing on the H.Avon for chub. This entry was posted on Wednesday, October 1st, 2014 at 10:19 pm	and is filed under Uncategorized. You can follow any responses to this entry through the RSS 2.0 feed. Both comments and pings are currently closed.